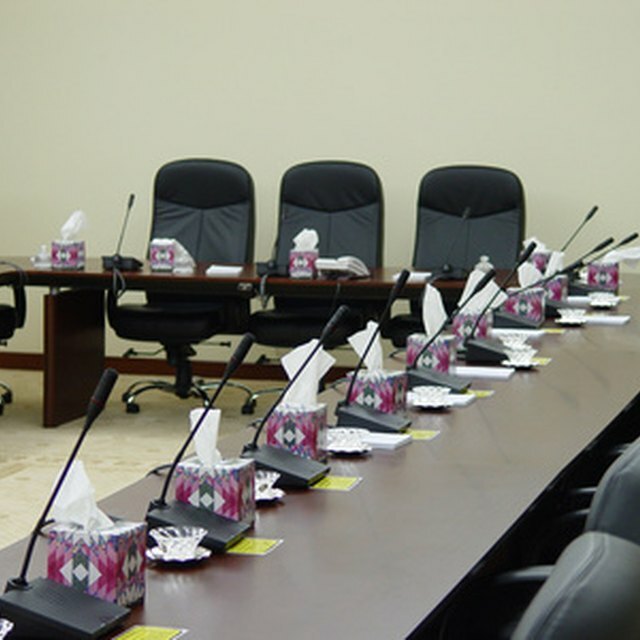 Businesspeople in different locations can conduct meetings in a virtual forum. Teleconferences, videoconferences and webconferences have removed the need for participants to meet face-to-face. According to BNET, teleconferences are the most popular type of virtual meetings. Teleconferences allow people from anywhere in the world to join the same telephone call and share information. BNET adds that teleconferences are cost-efficient and easily accessible. Videoconferences are similar to teleconferences, but they include video feeds. According to BNET, employees who participate in videoconferences have the advantage of being able to see the other people in the meeting. Although videoconferencing requires more extensive equipment, such as monitors and cameras, it can be worth the investment if your company plans on holding regular virtual meetings. Webconferencing is like videoconferencing, but uses the Internet, a webcam and a computer monitor or smartphone. Webconferences can be more interactive than videoconferences, because participants can share documents and view slideshows on their computers. They also have immediate access to the meeting's agenda and minutes. What Are the Benefits of Face-To-Face Communication in Corporate Culture?